What becomes clear pretty early on in Mia Hansen-Love's "Eden" is that despite the large roving ensemble of ravers and DJs and partiers, and despite the fact that there is a lead character, the dance-club "scene" is the real star of the film. "Eden" is an ode to French house-music (known as the "French touch"), and a portrait of the kids so inspired by DJ Larry Levan and the sound he developed at Paradise Garage that following his lead became not only a lifestyle-choice but a philosophy. The scene changes over time, starting out with underground raves in abandoned warehouses or old docked submarines, and morphing into parties at gigantic nightclubs with a velvet-rope policy at the door. "Eden" is long, but Hansen-Love's style is so observant and specific that it is always a compelling watch and ends up being sneakily profound. It also features one of the best soundtracks in recent memory, a history lesson of club music. The film is quite personal, despite its slow and insistent historical sweep, and it's co-written by Hansen-Love with her brother Sven, based on his experiences as a DJ in the French house scene. "Eden" focuses on one kid, Paul (Félix de Givry), a university student obsessed with "Garage" music, and blowing off his dissertation because of his party schedule. He wants to be a DJ, and hangs around the DJ-tables at raves, asking questions, bonding over music. The DJ is the rock-star, powerful and glamorous. Paul's mother does not understand what her son is doing with his life. But Paul is devoted to music, and knows the kind of sound he wants to create, a mixture of "euphoria and melancholia." He has a partner in this pursuit, and they create themselves as a DJ duo called "Cheers," modeled in part on their idols, Daft Punk (who appear as themselves throughout the movie in a running gag where they try to get into clubs and nobody recognizes them). If you remember the early-1990s rave scene, Hansen-Love's film will ring so true. Teenagers, through word of mouth, or cryptic messages placed in the back pages of fanzines, gathered in out-of-the-way places, often armed with secret passwords for entry, and got "lost in the music." Ecstasy rose as the drug of choice, bringing with it its famous warm-fuzzy feelings (as opposed to the more selfish high from cocaine in the '70s and '80s). You had to know where the party was. You sought it out. Over time, house music rose in influence, sweeping the world, and the DJs who started out spinning records at illegal raves in dilapidated abandoned buildings began to get better-paying gigs at high-class joints in places like St. Tropez. Hansen-Love is very interested in people, but she is more interested in the larger movement of their lives, and how time pushes them along and changes them (or doesn't). Surrounding Paul is a large ensemble of good friends, and we get to know them almost by osmosis, typical of Hansen-Love's subtle approach. There's Arnaud (Vincent Macaigne), hilarious and bitter, haranguing his friends repeatedly about "Showgirls," screaming that it is a masterpiece and why won't they get that? There's Louise (Pauline Etienne), a sweet and supportive party girl, who dates Paul for a couple of years. Their relationship is intimate and intense. Cyril (Roman Kolinka) is an artist, working on a comic book, creating posters for Paul's DJ career, and battling depression. "Living at night depresses me," he says. Other people come and go. They enter the scene, and they leave it. 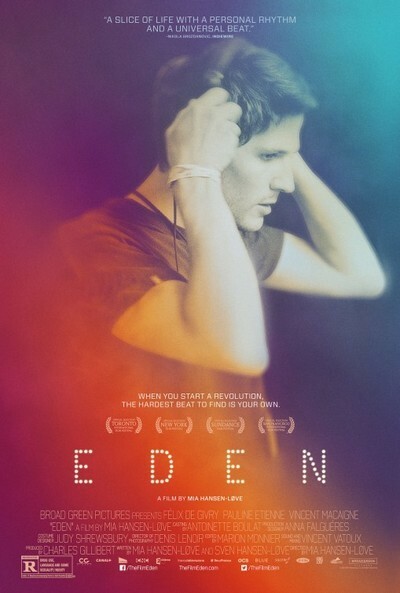 Throughout "Eden," Mia Hansen-Love features different long takes where she follows a character through a rave, or a club, or a dance-party, through the gyrating thrashing throngs, the neon and the darkness pulsing through the frame along with the music. The scenes repeat. Denis Lenoir's cinematography is beautiful, evoking the eternal nature of the dance-club scene and yet sensitive to its nuanced changes, how it moved from DIY to corporate. Hansen-Love's films (four features thus far) are "about" many things—first love, family life, suicide, drug addiction—but the plot is not paramount. "Goodbye First Love" told the story of a young girl's first romantic experience, and Hansen-Love observed from a distance. It's not a cold style, just uninterested in the common use of catharsis, melodrama or even plot. "The Father of My Children" was about a busy film producer with a loving family, who puts a bullet in his head when his business starts to implode. In that film, Hansen-Love stays with the family in the aftermath of the tragedy, watching how they adjust and deal with the financial and emotional chaos he left behind. She continues to watch and look when other filmmakers, interested only in the plot, turn away. Her films bring with them a feeling of the relentless and heavy push of time itself. How do we "get over" things? Well, it takes time. Time does not heal all wounds, but it does change our relationship to painful events. Paul experiences that in "Eden" when he meets up with an American ex-girlfriend (an awkward and sweet Greta Gerwig) years later when he DJs a party at P.S. 1 in New York. There is a poignancy in their encounter, a sense of a road not taken, but the sharpness of the initial pain has lessened. Time has done its work, off-screen. This is a hard quality to capture on film, although we all know it from real-life, and Hansen-Love accomplishes it repeatedly. She devotes herself, methodically, to what her characters do, refusing to zoom in, so to speak, on the highs/lows of emotion. Those highs/lows exist, but they are not lingered over, or fetishized. There's almost a George Eliot quality to her work. George Eliot's novels often give the impression of an omniscient narrator sitting on a cloud, staring down at the pain and anxiety of human life; that distance provides the perspective necessary to tell the story. Paul's journey in "Eden" features many elements, creating a tapestry of one man's life: the inappropriate women he dates, the financial debt he piles up, family problems, drug problems, good times with friends, sweet moments with women he loves. The acting in "Eden" is naturalistic and spontaneous. "Eden" takes place over 20 years, and, except for haircuts and facial hair, nobody visibly ages. Hansen-Love is interested in things other than being "realistic". ("Goodbye First Love" had the same disinterest in "aging" the actors). The group scenes with Paul and his friends are wonderful, thrusting us into their familiar dynamic, the jokes, the philosophical conversations, the way everyone speaks over everyone else. Like the dance-club "scene," this group feels real. Hansen-Love has a great eye for detail. Watch for the expression on the harassed waiter's face when someone in the group orders an "apple juice" at 4 in the morning. Or the hilarious section when Paul dates a woman only interested in him because he is a DJ "name," stringing him along in a sexless relationship for a couple of years, hoping she'll find someone better. That character only appears in two scenes (such is the sweep of time covered in "Eden"), but the script is so efficient, so specific, that we get the entire picture in a couple of snapshots.